We’ve had some great feedback this week on our two projects for London Design Festival 2018. We love the diversity of work that comes our way and these projects tap directly into our experience delivering innovative architectural pavilions and one-off creative installations. It’s exciting to see and hear such positive comments from our clients, the designers, visitors and the press. 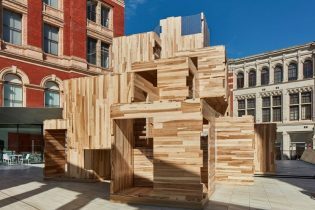 The 9m-high cross laminated timber MultiPly pavilion can be found in The Sackler Courtyard at the V&A. Our workshop and installation crew demonstrated precision, skill and attention to detail in realising this Escher-like maze of CLT tulipwood. Es Devlin’s ‘Please Feed the Lions’ saw our scenic artists and sculptors create a giant, fluorescent-red replica of a Landseer lion that spouts projected poetry into the night. Mounted on a ‘stone’ plinth, both lion and plinth are incredibly convincing. 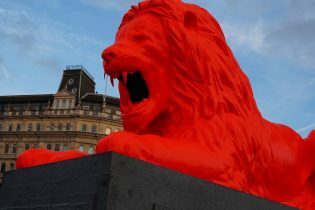 Not only was Es Devlin asked how she secured permission to paint a Trafalgar Square lion bright red, but visitors have also inquired what preceded the lion on the plinth. Great praise indeed for our scenic artists.